GigaSpaces today announced the results of a benchmarking study that spotlight improvements of the latest Intel® hardware breakthroughs. 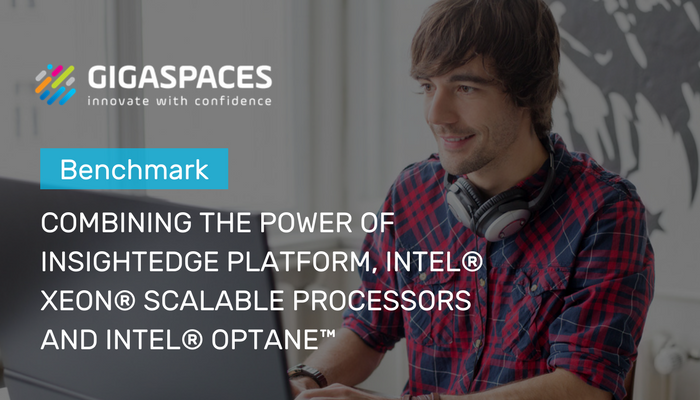 The study compared GigaSpaces InsightEdge Platform on Intel® Xeon® Scalable Processors and Intel® Optane™ SSDs against previous-generation Intel products. The results of the study show faster queries and load times on the platform, helping enterprises to access and act on insights the instant data is available. Time to load data to the InsightEdge Platform was 33% faster, and query times improved 23%(1) (details follow below). These results can be replicated in enterprises using on-premise, cloud, and hybrid cloud deployments. The synergies of the combined GigaSpaces platform and Intel technologies accelerate AI innovations. Integration between GigaSpace’s InsightEdge with BigDL —a distributed deep learning library for Apache Spark* software— and the Intel® Math Kernel Library for Deep Neural Networks (Intel® MKL-DNN) creates an infrastructure-optimized solution for deep learning workloads running on Intel® Xeon® Scalable processors. GigaSpaces MemoryXtend, a multi-tiered data storage architecture supports a hybrid storage model where data is stored on the SSD, leveraging Intel® Optane™ SSDs and indexes are stored in RAM, resulting in the support of larger data workloads while maintaining high performance. To generate the results, GigaSpaces ran geospatial and advanced data analysis on 4GB sets on the InsightEdge Platform to perform real-time operational decision-making. The tests compared the Intel® Xeon® Platinum 8168 processor and Intel® Optane™ SSD DC P4800X Series against the Intel® Xeon® Processor E5-2660 v4 and the Intel® SSD DC P3700 Series(2). Click here to see the benchmark results. This post was originally published on Business Wire. (1) Benchmark results were obtained prior to implementation of recent software patches and firmware updates intended to address exploits referred to as “Spectre” and “Meltdown.” Implementation of these updates may make these results inapplicable to your device or system. (2) Configurations: Baseline, two-socket Intel® Xeon® processor E5-2660 v4, 2.0 GHz, total 28 cores, Intel® Turbo Boost Technology and Intel® Hyper-Threading Technology (Intel® HT Technology on, 256 GB total memory, 16 DIMMs, 16 GB, 2,133 megatransfers per second (MT/s), DDR4, CentOS 7*, Intel® SSD DC P3700 Series (1.6 TB Intel® 3D NAND SSD with NVM Express* [NVMe*]) compared to a two-socket Intel Xeon Platinum 8168 processor, 2.7 GHz, total 48 cores, Intel Turbo Boost Technology and Intel HT Technology on, 192 GB total memory, 12 DIMMs, 16 GB, 2,100 MT/s, DDR4 LRDIMM, 1 x 800 GB, CentOS 7 Linux*, Intel® Optane™ SSD DC P4800X Series (375 GB, NVMe).